RSS stands for Really Simple Syndication. An RSS feed, also known as anews feed, is a syndicated news feed in an XML format to which youcan subscribe. Most HSL subscribed databases support RSS feeds forsearch alerts and journal alerts. 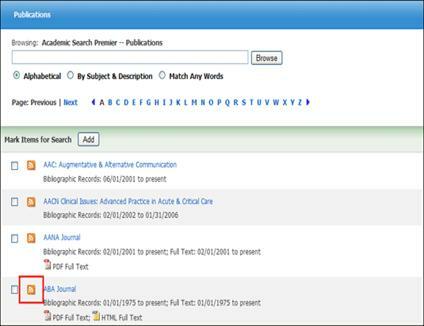 RSS enabled alerts allow librarians and users to feed results from E-resources search alerts and journal alerts into their RSS readers and aggregators, as well as their web sites. Why should I use a news feed reader? Using an RSS feed reader allows you to be alerted when new articles on thetopics you're interested in are available. Many feed readers will pop up a newwindow when new results become available. When you are alerted of newHSL E-resources Search or Journal Alert results, you can click on a link that will take you directly to them. How to set up RSS feeds? link on the Alert/Save/Share pop-up screen. 3. Click the Save Alert button. 1. Click the Publications link at the top of the EBSCOhost screen. Once you have found the desired publication, click the RSS alert icon to the left of the publication name.